A continuation of my list of essential titles from Iran’s diverse and impressive national filmmaking scene. This part of the list encompasses movies released from 1997, when Abbas Kiarostami made history by becoming the first Iranian director to win the top prize at the Cannes Film Festial, through the present. Three men who may or may not be part of a documentary film crew travel from Tehran to a remote, rural village to observe the funeral of an elderly woman who is reportedly on her death-bed. Only the woman refuses to oblige them and doesn’t die, thus keeping the men stranded there indefinitely. 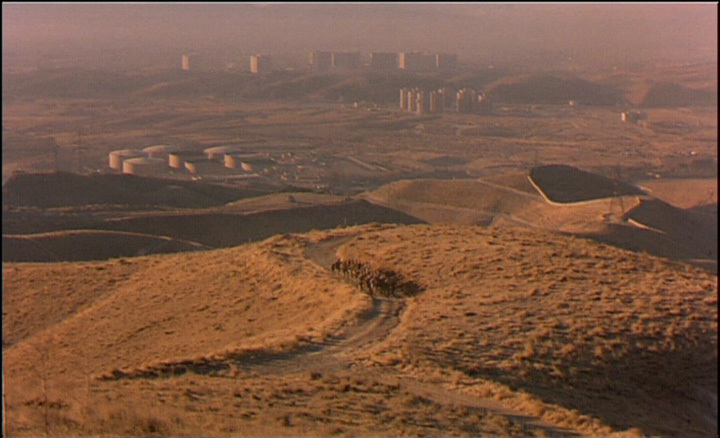 This gorgeously shot, cosmic and comic vision of the conflict between different ways of life in contemporary Iran is in some ways director Kiarostami’s magnum opus. Indeed, he virtually turned his back on narrative filmmaking for a decade until triumphantly returning with Certified Copy in 2010. A quantum leap forward for director Jafar Panahi, best known previously for his acclaimed but lightweight The White Balloon, this tough-as-nails feminist film dramatizes the plight of various women (prison inmates, a prostitute, a pregnant woman who incurs the wrath of her in-laws by not giving birth to a boy) in a repressive, theocratic society. The film’s title refers to its overall structure, several key camera movements and the idea of misogyny as a vicious cycle. Unsurprisingly, this was banned in Iran but rightfully won acclaim practically everywhere else it played. Marzieh Meshkini, Mohsen Makhmalbaf’s wife, wrote and directed this delightful trio of interconnected stories about female protagonists at different stages of life: a nine year old girl who is told she is now a “woman” and can no longer play with boys, a young woman who defies her domineering husband by participating in a bicycle race, and an elderly woman who unexpectedly inherits money and finds herself independent for the first time in her life. This unusually accomplished debut film is infused with a gentle, intoxicating surrealism. Mania Akbari, the talented actress who appeared in every scene of Kiarostami’s Ten, takes a page from the master’s book in crafting her first film as writer/director: seven vignettes in which the same actor (Bijan Daneshmand) and actress (Akbari) play a different couple facing a universal problem. Every segment is dramatically compelling and well acted but, as filmmaking, this shot-on-video feature is absolutely thrilling; practically every scene unfolds in a moving vehicle in a single long take and, one in particular (involving the characters interacting between a car and a motorcycle), is an astonishing piece of cinematic choreography. A gut-wrenching and eye-opening drama about children living in a refugee camp in Kurdistan near the Iraq/Turkey border in the days leading up to “Gulf War 2.” Moments of lyrical beauty somewhat leaven the otherwise disturbing brew and the cast of non-professional child actors is indelible, especially Soran Ebrahim as “Satellite”. A bracing reminder of how innocent victims are the tragic byproduct of every war, Bahman Ghobadi’s third feature confirmed his place as Iran’s best young filmmaker. Director Mohammad Rasoulof is most famous for being sentenced to six years in prison, along with Jafar Panahi, for allegedly planning to make a film that would have incited anti-government protests. As this fascinating and poetic movie proves, he is also a very talented filmmaker. 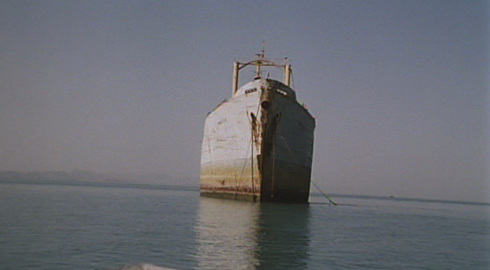 The title refers to the central location – a rusted, abandoned oil tanker floating in the Persian Gulf that functions as a makeshift city for the film’s large cast of mostly Arab characters. This includes an idealistic schoolteacher, a pair of forbidden young lovers, a man who perpetually watches the horizon for nothing in particular and the Svengali-like “Captain” who presides over everyone. A potent portrait of an isolated, self-contained community, this deserves to be more widely known. Bahman Ghobadi’s mesmerizing road movie about an elderly Kurdish pop star who travels from Iran to Iraqi Kurdistan to perform one final concert after the fall of Saddam Hussein. Accompanying him are a dozen of his “children” (in the Colossal Youth sense) on a rickety bus that encounters increasingly perilous obstacles along the way. What starts off as a comedy gradually darkens over an hour and a half until the film takes an unexpected left turn into the realm of the purely metaphorical in its haunting final act. The soundtrack of Kurdish music is phenomenal. Jafar Panahi has become increasingly known as a political activist (both in movies and in life) but this incredible comedy reminds us how a great artist can skillfully and seamlessly integrate ideological points into the most entertaining stories imaginable. Since the Islamic Revolution, women have been banned from attending men’s sporting events. So what are a bunch of female soccer fans to do except disguise themselves as men and attempt to sneak into the local stadium? An ideal point of entry for anyone looking to understand Iranian cinema and culture, this hopeful and humane film is one of my favorites from any country in the past decade. Like an Iranian L’avventura, this sure-handed, impeccably constructed chamber piece tells the story of a woman, the Elly of the title, who disappears while vacationing with a group of friends by the sea. The attempts her companions make to locate her exacerbates tensions that already exist between various members of the group, to the point where Elly’s fate becomes almost irrelevant in the grand scheme of the movie. A wonderful “psychological” journey that doesn’t seek only that which it can explain. Untitled (‘For Jafar Panahi & Mohammad Rasoulof’) – Protest Film by (anonymous) Iranian Filmmaker from Cine Foundation International on Vimeo. This entry was posted on Friday, April 8th, 2011 at 7:13 am	and tagged with 20 Fingers, Abbas Kiarostami, About Elly, Asghar Farhadi, Bahman Ghobadi, Half Moon, Iron Island, Jafar Panahi, Mania Akbari, Marzieh Meshkini, Mohammad Rasoulof, Offside, Taste of Cherry, The Circle, The Day I Became a Woman, The Wind Will Carry Us, Turtles Can Fly and posted in Film Reviews, Historical Movement / National Cinema Primers. You can follow any responses to this entry through the RSS 2.0 feed. ..A man makes a career out of collecting the sadness of others in this surreal drama from Iranian filmmaker Mohammad Rasoulof. A handful of girls struggle to make their way into the mans world of an Iranian soccer stadium in this comedy from writer and director Jafar Panahi. Three Iranian women must contend with a repressive political regime that has placed a stranglehold on nearly every aspect of their lives in this hard-hitting social drama.